This new range promises a high shine, salon quality finish (don't they all?) with up to seven days wear. There's also a new brush with an easy-grip handle, striated rod (which basically means the brush rod has indented stripes, designed to distribute polish evenly) plus 1000 bristles with a rounded tip. After reading that I was more excited about the brush than anything else! So does the brush deliver? I love it, actually. 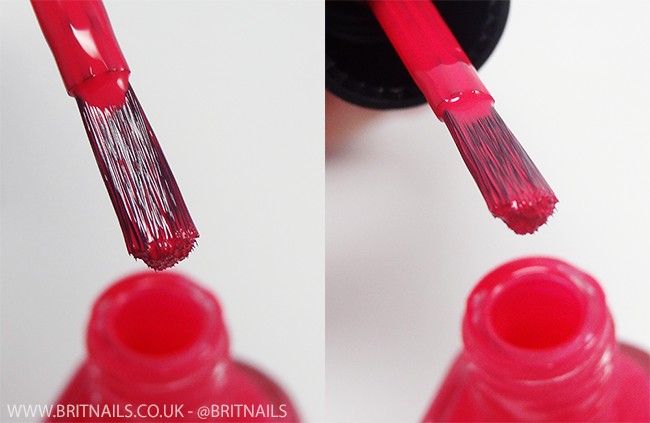 It makes application very easy and distributed a perfect amount over my nails (down to the striated rod!?) The rounded tip means little to no cleanup. One thing I will say is it's a bit on the thick side and not everyone will like that in a brush. Personally though, I wish all my polishes had this brush. The bottles have a rounded square lid which removes to reveal the easy grip handle underneath. I like the little Kiko logo on the lids! As for the formula, for these 3 shades at least, it's excellent. 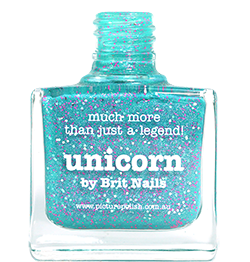 Super smooth and very pigmented, it glides over the nail easily and leaves a glossy finish. They promise up to 7 days wear, and while a busy nail blogger can't really wear a polish for 7 days, I got up to 2 with no chips before I had to remove it. Usually I refrain from commenting on wear time because there are so many mitigating factors when it comes to it! Fuchsia (12) is a hot pink creme. Flawless formula, I used 2 coats, no top coat. For a price tag of £4.90 each, these are wonderful polishes with a better formula than some high end polishes I own. The shades I was sent are not really my thing, but there's currently 48 to choose from over the entire range. 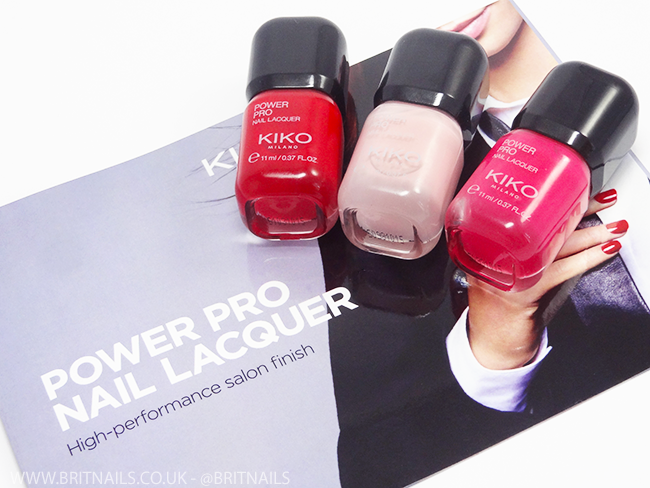 What do you think, are you a Kiko fan? I'm always surprised when I see bloggers being sent Kiko press samples because the brand only sends them outside of Italy. And apparently they think it's a great idea to send all the same colors even though the range has many many more. Not surprised. I've tried a few and love the formula, though I wish they'd step it up and not just stick with crellies and cremes. I agree, a few different finishes would be nice in the future! I love Kiko's shimmer polishes! I saw these in store recently actually! I didn't buy them because I didn't like how the bottles and cap looked and now I see they have a wide brush I'm glad I didn't get any since I don't get along with those. I did purchase from their regular line and loved the quality of that polish. The lady in the store was absolutely horrible and rude though which put me off buying from this brand ever again in the future. I do love your swatches! Oh ew, that always puts me off too! Thinking about it the staff in the London Kiko store weren't that great either! I love these brushes though, maybe because my nails are huge! 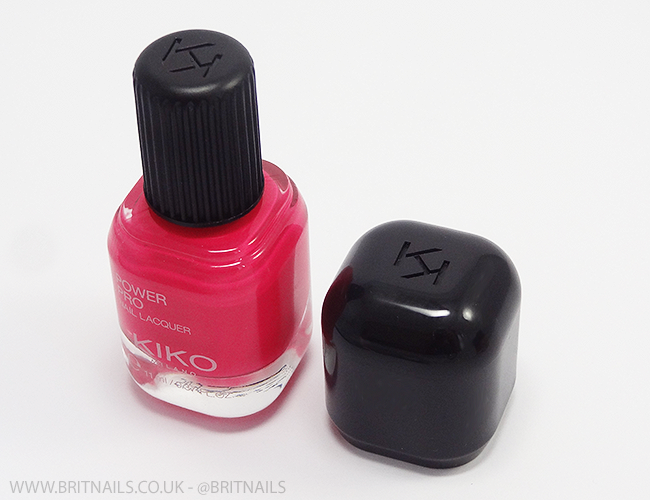 I'm a Kiko fan but I wish they'd by now started naming their polishes - the number thing gets on my nerves. While I was tempted to get these (am major obssessed by the brush) I don't think they innovated that much on the colour range - it's like a copy of the colours they had in their 'old collection/range', which is a bummer for those, like me, who already own a lot of their polishes.